Providing your cat with complete nourishment and care starts with understanding what she needs. Here's an overview of the essentials for helping your cat to thrive. From providing a complete and balanced diet to avoiding the risks of obesity, what you feed your cat is essential. 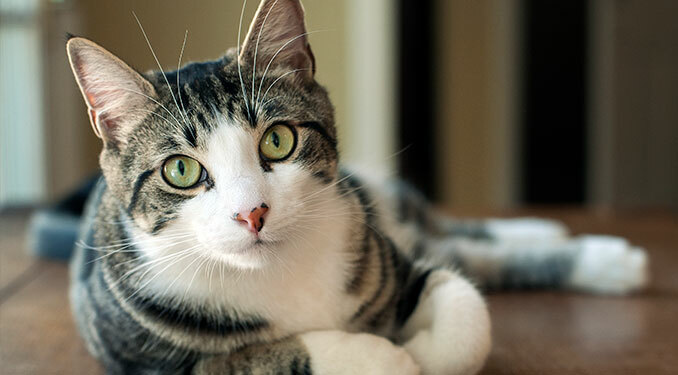 At Purina, one of the reasons we love cats is because of the warm companionship they offer. But just like they provide us with affection, cats need plenty of affection in return. Make sure you spend plenty of time with your cat so that she becomes properly socialized and feels like a valuable and happy family member. While cats are fond of sleeping, they also need to move around. They love to play and practice their hunting skills. Pouncing and running are stimulating activities that help them exercise their natural instincts. Bonus: Frequent activity helps ward off obesity. Make sure your home is comfortable and stimulating for your cat. From providing opportunities to climb and explore safely to making sure she feels secure and comfortable while she's eating her dinner or having a nap, there's a lot you can do to make sure your cat feels at home. If your cat is allowed outdoors, make sure she can always find her way home. A collar with an I.D. tag, including her name and your phone number, can make it simple for anyone that may find her to return her to your home. For additional reassurance, have a veterinarian implant a microchip in your cat, which will help any shelters or organizations find her home. You may want to consider a collar and tag or microchipping even if your cat is an indoor cat, since it's possible that she may accidentally slip outside. Make sure you have unbreakable food and water bowls, a clean, accessible litter box, somewhere for your cat to scratch and climb, and a comfortable place for her to sleep. Use this list as a starting point for providing what your cat needs.